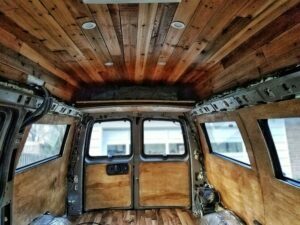 A few weeks ago we did a post on how we insulated our conversion van. The last thing we did in the insulation process was laying down Reflectix on the floor. Now we get to install the rest of the floor! 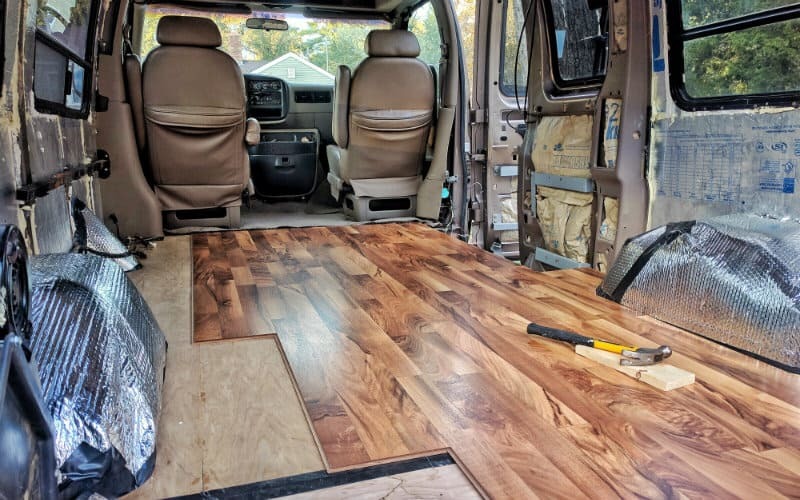 There are several options for van flooring. 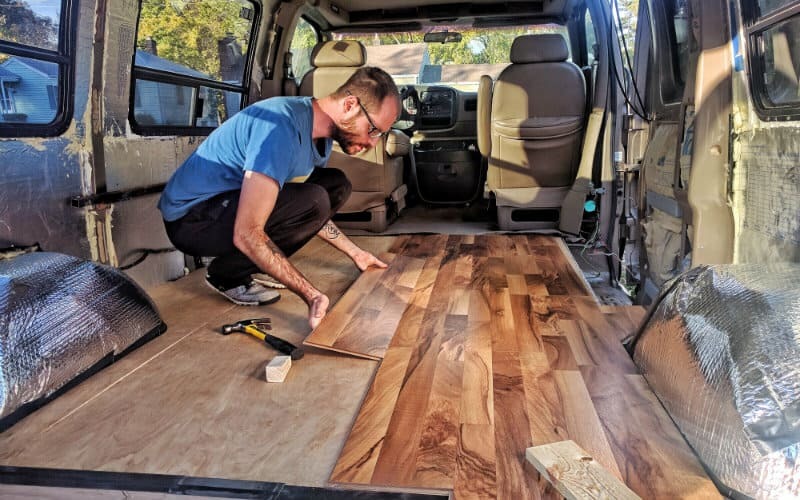 Many van dwellers choose vinyl flooring because it’s thin and waterproof. 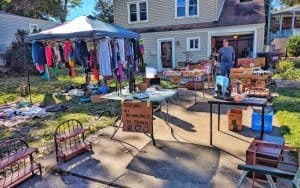 Our neighbor offered us some old hardwood flooring, but the ¾” thickness would have taken too much height out of the van. We ultimately decided to use laminate flooring because it looks better than vinyl, it’s easy to install, and it’s thinner than hardwood. We found some gorgeous laminate flooring with interesting wood grain effect at Menard’s (our new favorite store! And no, we don’t get paid to say that). We needed 3 boxes (60 sq ft) to do the entire floor. Because of some leaky rear door seals, we had a run in with mold growing on our subfloor. We ended up ripping out the entire floor, installing a new mold-proof subfloor, and redoing the flooring with a different material. Read about mold prevention and our new floor here. 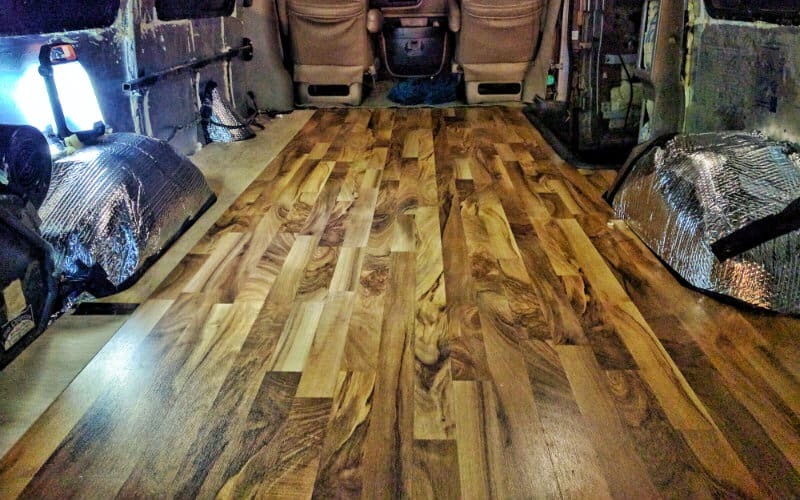 We still think laminate is a good option for a van floor, but there are other options as well. 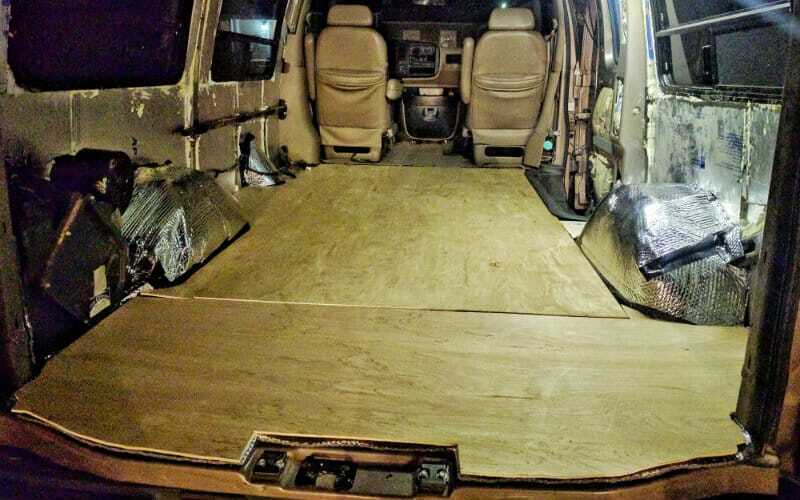 Check out the flooring section on our Build Your Van page for more info on different options. The instructions below will show you how to install a subfloor and any kind of tongue-and-groove flooring (laminate, vinyl planks, etc). We had a few frustrations and setbacks, but once we got into a good groove the flooring install flew by. We got most of it done in a day. 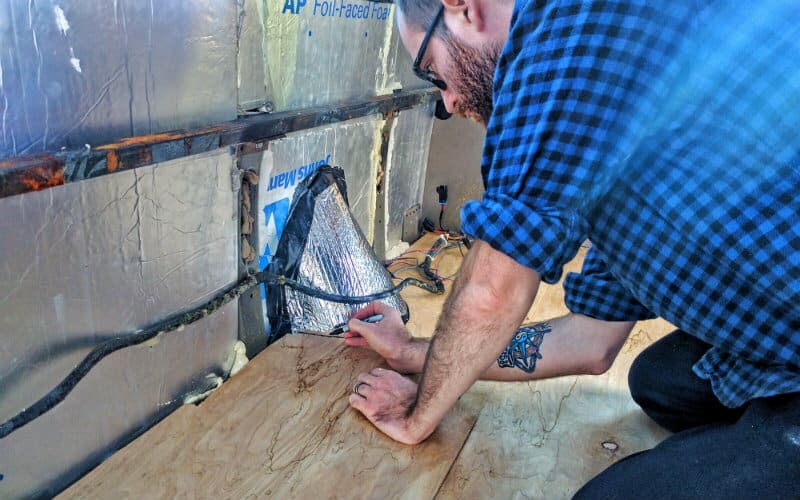 A metal van floor doesn’t provide much of a temperature barrier between you and the outside, so you’ll want to put down some sort of insulation. We used Reflectix for this because it’s thin (less than 1/4″ thick) and easy to work with. The R-value of Relfectix is minimal and its reflective properties won’t work if there isn’t an air gap, but it’s better than nothing. An even better choice would be 1/2″ pink extruded polystyrene sheets. We were able to roll the Reflectix straight down the length of the van, then Jayme made cardboard templates for the wheel wells and other odd shapes along the walls. We then traced the templates onto the Reflectix and cut pieces to fit. We used 3M High Strength 90 spray adhesive to glue down the Reflectix, and Gorilla Tape to cover the seams between pieces. The subfloor provides a sturdy base on which to lay your actual flooring. We used 1/4” plywood underlayment for this, which worked perfectly. 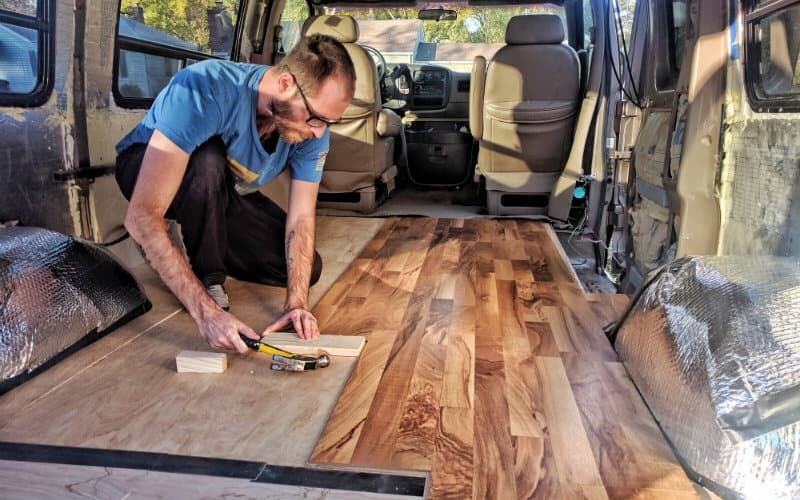 Many van lifers use thick 3/4” plywood for their subfloors, but it’s not necessary to go that thick and it cuts out too much height. This is a van, not a house! Update: We recommend using 3/8″ or 1/3″ plywood for the subfloor. These thicknesses add much more “grip” for screws than 1/4″, but don’t take away as much height (or add as much weight) as 3/4″. Installing the subfloor was just like installing the Reflectix. We started by laying down a full sheet and glued it down with High Strength 90. We then used the templates we made for the Reflectix to trace and cut pieces for the sides and back of the van. The jigsaw really comes in handy here! You’ll probably have to fine tune your cuts before your subfloor will fit perfectly around things like the wheel wells and fuel pipe. You’ll want to put down the laminate flooring one row at a time. 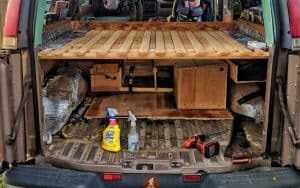 We started with the passenger side because we could run one row along the side door and wheel well all the way to the back. Start the next row with a half piece so that it’s offset from the first row. 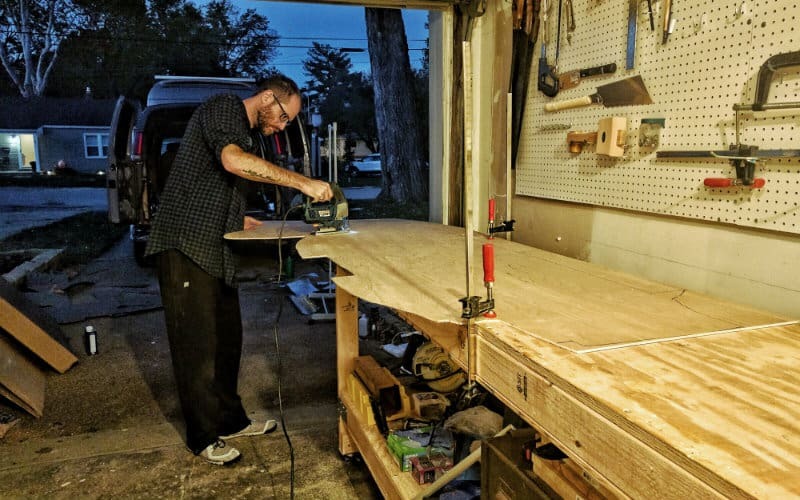 We used a miter saw to cut the first piece in half, but you could also use a jigsaw or circular saw if you have a steady hand or a jig. Lock the long edge together first by inserting the new piece at an angle. Use scrap wood and a hammer to tap the end of the board and lock in the short side. That’s pretty much it! This flooring is a “floating floor,” which means you don’t need nails or glue to hold it down. This Youtube video helped us a lot on the install. Check it out if you’re having trouble. 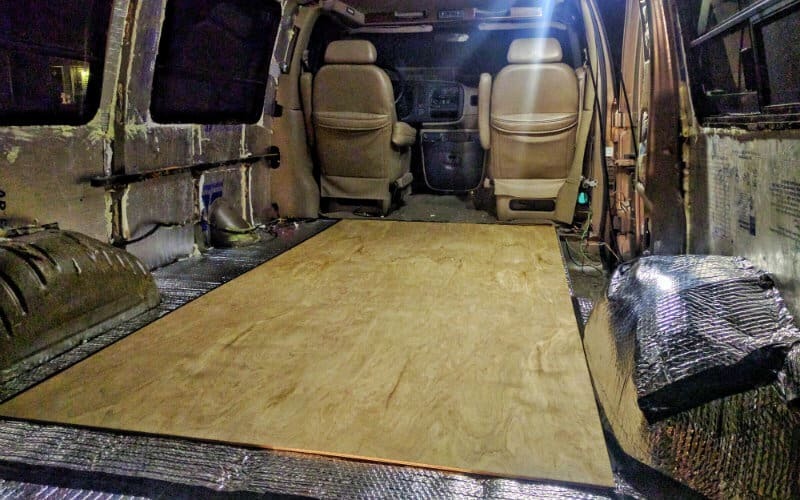 We used the same templates from the Reflectix and subfloor installs to cut and trace pieces of laminate flooring for the odd-shaped areas at the back and sides of the van. Note: You may want to cut off your laminate flooring a few inches from the back of your van. 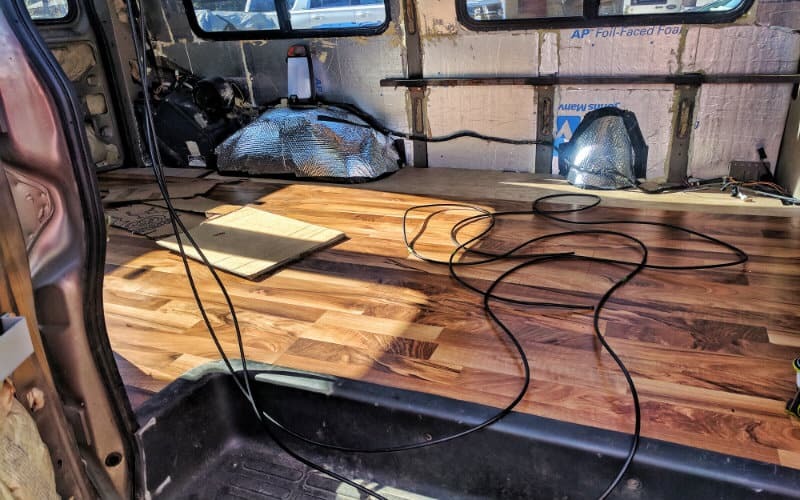 We spent time tracing and cutting our flooring to perfectly match the contours of the rear of our van only to find out that the flooring is so thick it makes the doors stick. We had to recut the end pieces to fix this. Look At That Beautiful Floor! It’s finally starting to look like a home! Once we finished the install, we were so excited that we had to climb into the van for a little dance sesh celebration, tap dance style. John can’t fully stand up in the van, but he’s great (terrible) at dancing hunched over. Now that we have our flooring installed we can start on our walls! Stay tuned for more build updates and don’t forget to follow us on Instagram @gnomad_home and on Facebook at: Gnomad Home. Thanks for all of this information! 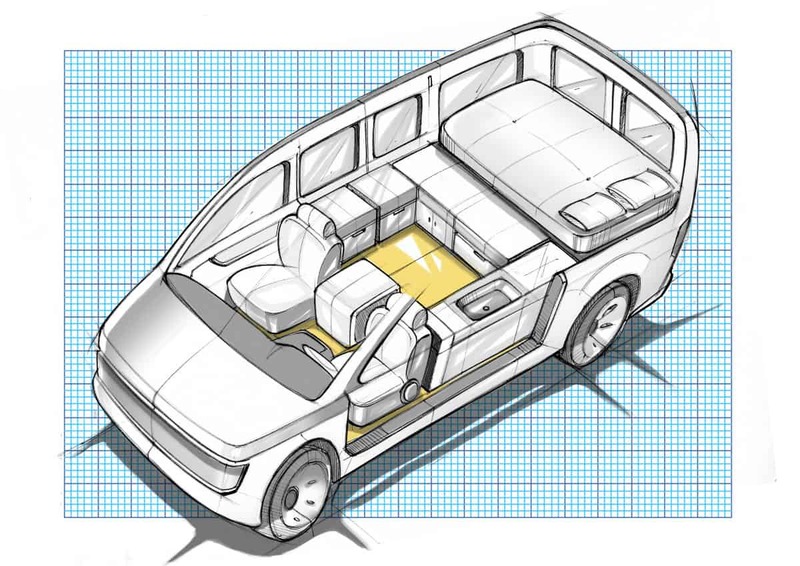 Question about where your floor meetings the door behind the passenger seat: how did you get the full build up (insulation, subfloor, laminate) to fit under the plastic floor cover?? Having trouble with ours – will probably need a trim piece – but curious if you did anything in particular. Hello! Thanks for all this awesome information. Super complete and clear. 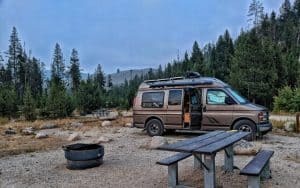 We recently bought a 1995 Ford Econoline Conversion van and we are following your guides. 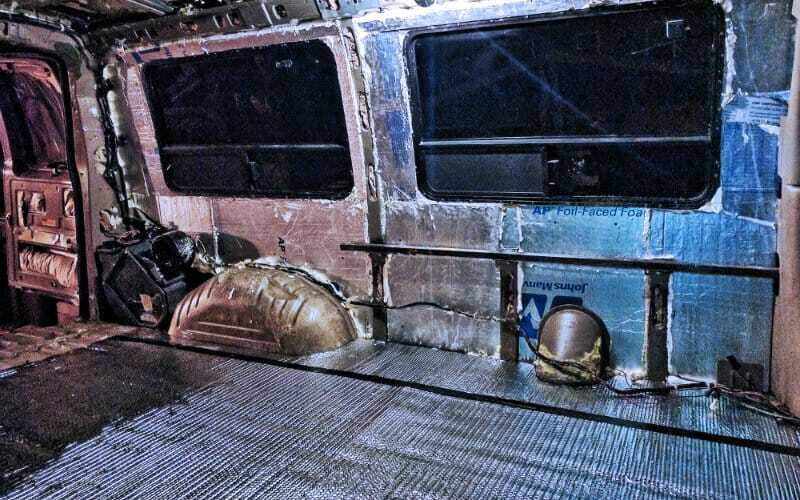 The black box next to the wheel, on the right side of the rear, is that a heat-a/c unit? Did you guys remove it? Or just leave it there? Did you disconnect any valve/cable? We have the same thing in our van and we don’t know what to do wih it! We wouldn’t mind leaving it there, but i’m concerned that it might be dangerous? Hi John. 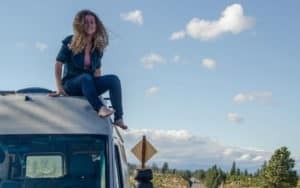 I have just started my van conversion & find your blog very helpful. Thanks for so much detailed info, especially on the flooring, which I’m tackling now. I also need to have my AC serviced & wondered who you used in Taos, where I happen to live. Happy Trails! OK, thanks John. I’ve had brake work done at Metric Motors before & know they do good work. I spent this afternoon along the banks of the Rio Grande on one of our first spring days – it’s an awesome area. Happy Trails! OK thanks John. I’ve had brake work done at Metric Motors & know they do good work. I was able to spend this afternoon along the banks of the Rio Grande as spring finally begins to take hold after a brutal winter. Taos is amazing country – happy trails! Looks awesome! We are in the process of insulating the floor and wondering if we need to put wooden beans on the metal floor to make sure we secure the the subfloor. Did you drill your kitchen/bed frame into the laminate flooring? Ooops, just realized you answered this with the comment below! Hi Veronica, glad you found the answer! 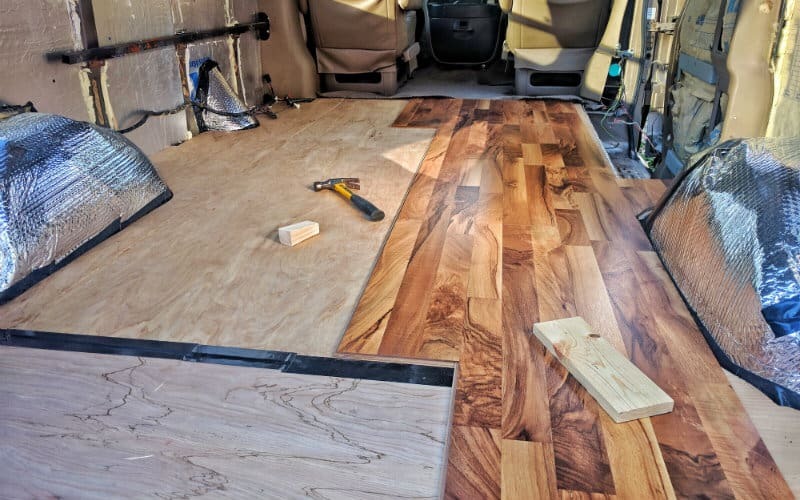 🙂 I would also recommend checking out our recent blog post about mold prevention and redoing our floor for some new tips on installing a van floor. Hi! Finding your website has been such a MIRACLE! I love your story, and how thoroughly and efficiently you’ve documented and made your process a collective resource! I recently acquired an express van and I’m starting my build this week. Starting with gutting, the floor and the insulation. I’ll be working on it this spring and however long it takes. Maybe I missed it on this post, but how did you seal the flooring? Did you use any sort of filler between the edges of the laminate (now vinyl) and the walls? 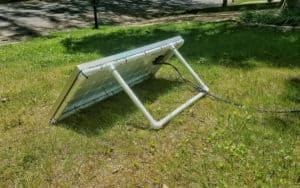 Thank you for sharing this blog of yours. Laminate flooring is DIY-friendly, durable and versatile.